EDITOR’S NOTE: This is a guest post by Leopoldo Martínez D., a researcher and consultant on social media corporate intelligence and lecturer at UCV and IESA (Venezuela), and it was originally published on his blog (in Spanish). As I stated in the first part of this post, I will show how online reputation evaluation was used in a real situation related to the tourism industry. January 6-15, 2017, a music festival was scheduled to be held in Playa del Carmen, as well as a series of events related to both music and the tourism industry. On January 15, a shooting occurred in a well-known bar where people were celebrating the end of the festival. When the shooting happened, messages quickly spread through social networks to give information and comment on the context in which the incident and how it happened. Some conversations revealed an interesting fact: The shooting was not an isolated event but stemmed from the “situation of crime that the Riviera Maya went through in 2011″. Could this affect the Riviera Maya’s reputation as a tourist destination? Could “several years in a situation of crime” have already influenced the tourism industry’s image? These are some of the questions that the public and private actors that provide services and products in this tourist area might have been asking themselves. EDITOR’S NOTE: This is a guest post by Leopoldo Martínez D., a researcher, consultant on social media corporate intelligence and lecturer at UCV and IESA (Venezuela), and it was originally published on his blog (in Spanish). In this previous post, I suggested that conversations taking place in virtual communities fostered by a digital marketing plan generate feedback that is useful for assessing and monitoring a digital’s marketing strategy’s performance. This feedback could generate a huge amount of valuable data (Big Data) which enables the creation of a knowledge base for the topic being talked about, who is participating, who is having the greatest impact on brand image, products, people, or organizations. This knowledge base can also be fed by discussions arising from unexpected events which are not part of the communication plan but deal with the virtual community’s topics of interest. To specifically assess the conversation’s impact, it is necessary to pay attention (beyond listening) to what is being said through metrics (qualitative and quantitative) that reflect the online community’s perception on brands, products, people, or organizations. After all, this perception is a way to measure an online reputation. With this need in mind, the purpose of this post is to show how to use the active listening of conversations in social networks to evaluate your online reputation. 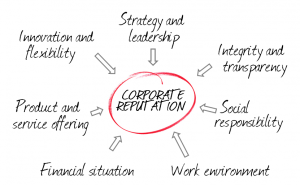 Do you need to understand the impact that social media and news have on your corporate reputation (or your customers’)? Now, a new MeaningCloud API enables you to analyze all that information in real time and structure it according to the dimensions of the most common reputational schemes. Some customers have been demanding us a precise way of understanding the impact that opinions from social media and other channels have on a company. Social monitoring tools provide a basic sentiment analysis that in the best of cases identifies that a certain comment (e.g. a tweet) expresses a positive or negative opinion about an entity, and use the aggregated data in diagrams and temporal evolutions. Nevertheless, analyzing a so multifaceted reality as the reputation of a company requires a more granular opinion analysis. So far, corporate reputation has been measured by interviewing and conducting surveys to customers and analysts, and it has been provided in the form of static periodic reports. But the number of customers who are not satisfied with a “snapshot” a posteriori -based on a few opinions- is constantly increasing. Now they wish to add to the picture the impact that social and traditional media have on their reputation, and access that information in a more up-to-date and actionable way to detect potential reputational crises well in advance. With this MeaningCloud update we have added a new Corporate Reputation API, which enables to include in the reputational analysis the huge amount of spontaneous opinions expressed in all kinds of media (social networks, forums, blogs, news websites) in real time. This API performs a reputational tagging of text: it receives a document (tweet, piece of news, comment in a survey), detects the mentioned companies, identifies the reputational dimensions involved and extracts the polarity that affects each one of them. All this with a high level of accuracy and granularity, distinguishing opinions about different companies than can coexist in a single sentence. The result is presented in the form of standard tags that can be used to aggregate, relate, detect trends, generate alerts, etc. Under the hood, the corporate reputation API uses a highly optimized pipeline that incorporates information extraction, automatic classification and polarity analysis techniques. In addition, it is based on standard interfaces and features SDKs that enable to integrate it into any available monitoring application or tool. More information here. Using this API you can complement the traditional reputational studies with a more agile and immediate analysis of the impact of social media, news, etc., and thus manage more dynamically such an important asset of your company. And don’t forget that with this MeaningCloud update we include two APIs from our previous product, Textalytics: Linguistic Analysis and Text Proofreading.